The SINGER 8763 Curvy features the innovative Swift Smart ? Threading System that has one touch threading! The Drop & Sew ? 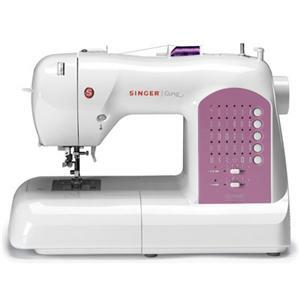 bobbin system, 30 stitch patterns including two fully automatic one-step buttonholes and optimum stitch settings are just a few of this machine?s features. "Included Accessories: General/All Purpose Foot, Zipper Foot, Satin Stitch Foot, Blind Hem Foot, Buttonhole Foot, Needles, Bobbins (4), Auxiliary Spool Pin, Felt Discs (2), Spool Caps (3), Seam Ripper/Brush, Screwdriver, Darning/Feed Cover Plate, Foot Pedal, Dust Cover, Power Cord, Instruction Manual "